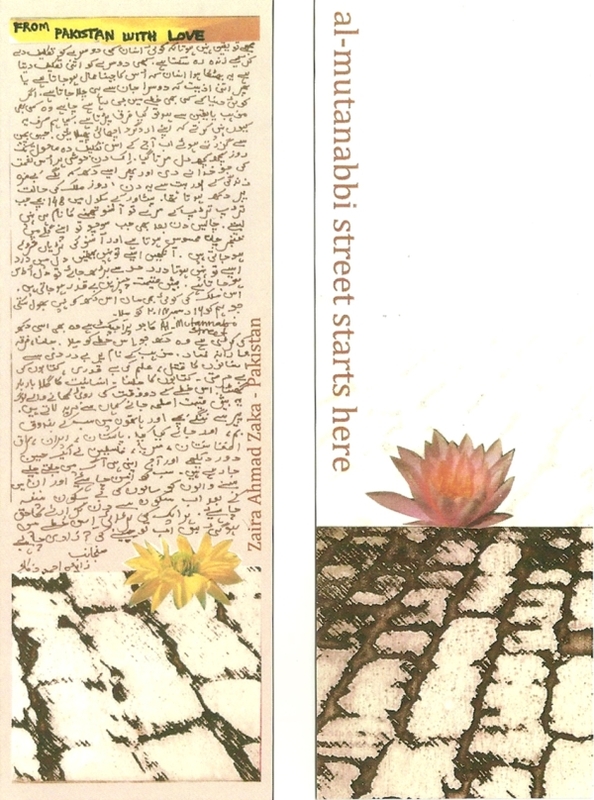 You may have arrived here because you’ve found a bookmark with the words “Al-Mutanabbi Street Starts Here”. Welcome to the informal community of writers and artists that is the Al-Mutanabbi Street Coalition. Wherever you are, in your home, in your reading group, in your local cultural centre, library or book-store, wherever literature and ideas are valued, Al-Mutanabbi Street starts there. To find out what the bookmark project is about, have a look at the “About” page. To see other bookmarks, click on “Bookmarks” and browse the various artists’ creations. If you’d like to make and contribute some bookmarks yourself, the “Guidelines” page is the place to start. Finally, here are some useful links to the other branches of this project: broadsides, artists’ books, printmakers, music, readings and exhibitions. New bookmarks and thoughtful statements from some of Laurie Alpert’s new students – find them here. Mustafa al-Hity: PhD in medicine, pediatrician, College of Medicine, Baghdad University. Assassinated 14 November 2005. He is number 32 on a list of more than 300 targeted and assassinated academics during the years 2003-2012. I am looking for other writers and artists, printers and book artists’, academics, translators, and teachers to join this project. Click onto the link to those academics who were assassinated and pick someone, that is the first step to joining this project. I am pasting in the call below – Please Write Me ! I am writing to you specifically as fellow artists, writers, poets, activists, image-makers, printers, teachers/academics, translators, and amateur and professional photographers. 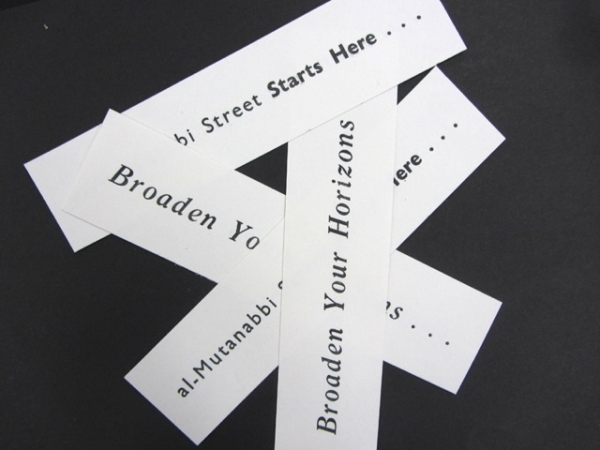 The Al-Mutanabbi Street Starts Here project has added a fourth visual call and response (in addition to the broadside/letter press response, the artists’ book response (including our small bookmark project), and the printmaking response). This time, the intention is to take from historical invisibility—-to memorialize and to honor—–the hundreds of academics (lecturers, professors, teachers) that were assassinated in Iraq during the US-led invasion and occupation, during the years 2003-2012. During this period, over 300 teachers were targeted by various groups with no one group taking responsibility. The assassinations occurred on university campuses, at the homes of teachers, and sometimes while they were driving. We cannot calculate the loss to the families of these victims, as well as the loss to the entire intellectual community of Iraq. The targeted assassinations of hundreds of Iraqi academics was an attempt to erase and intimidate those who teach, write, do research, and work to carry knowledge and collective and personal memories forward. Free speech and the free exchange of ideas is as important in a classroom as it is on al-Mutanabbi Street. I’ve come to the conclusion that since we are honoring targeted academics, we don’t necessarily need only professional photographers; rather, we need someone who understands the wider implications of these kinds of targeted assassinations. Perhaps the most daunting thing for a non-professional photographer would be following the material guidelines to prepare the photo for the project. If you understand this project and if you would consider joining, then choose the name of an academic and the details of their assassination as a reference point. The photograph we ask for should be a landscape image, either urban or in nature; it can be constructed or found. It could be an empty room or an open field, an urban parking lot or a grove of trees. You could simply take a picture of the first resonant empty space that you encounter. Some measure of understanding needs to be traversed and the only life it should hold is the remnant of the person that the photographer has chosen to represent. A key element here, is that the image is empty of people. The photograph itself buys us time with the viewer. The photograph should hold the body in place. Your image should hold this person in a kind of emptiness that is palpable, an emptiness that has enough small details in it for the viewer to slowly consider, and then, their vision should drift down to the name you have chosen and then back up again to the image. The photograph has to be strong but it also has to give way to the person that somehow inspired the image. The photo should be a way to take the viewer to the name and the life that held it. You will know the balance when you see it. Note: Choose a name from the following link below with the accompanying number. Let me know who you have chosen. Create your image after you have picked a name from the list of assassinated academics, rather than using a photograph you may have already taken. 1) 6 copies of one or two images. 2) Use any kind of paper you want. 3) Photo size: 8 x 10 or 8.5 x 11 or 11 x 14 inches. 4) Any photographic process: color inkjet printing, black and white, analog darkroom printing, mail order printing processes. 5) Please include the usual exhibit details about your photographs: title of your print, your name, country, subject’s name, print technique. 7) Please include an artist’s statement of up to 400 words. It’s important to remember that this is a project of art in the service of ideas rather than a work for an art exhibition. Within your statement let us know your “point of entry” for what you are trying to get at or reflect upon with your photograph. 8) You have six months to complete this project — from the date you notify me that you are interested in participating with this project. I’d ask that you read and watch some of the links below and let the ideas of our project, Al-Mutanabbi Street Starts Here, sink to the bone before you begin. Posted on August 29, 2018 August 29, 2018 Categories Al-Mutanabbi Street Starts HereTags photographyLeave a comment on Join our photography project! Read more about Cathey’s letterpress-printed bookmarks here. I had the pleasure of meeting Cathey at the University of the West of England, Bristol, a few weeks ago when she had just finished printing them. She told me it was her first experience of two-colour printing. I had the privilege of participating in a lunch-time reading at the University of the West of England on Thursday 8th March. This included a tabletop exhibition of books, broadsides and prints made for the project. It was good to see old friends (both people and printed works), and to meet new ones. Julie Bruck’s poem always makes me shed a tear. Our project, Al-Mutanabbi Street Starts Here, extends a hand in friendship and solidarity to the Iraqi people who have endured so much. We are poets, writers, and artists who will never turn our back on Iraq and their cultural communities. We are 600 cultural arts workers from 20 countries who hold the spirit and values of al-Mutanabbi Street close to our hearts. We dedicate our readings this year to Mohammed al-Khashali, the owner of the Shabandar Cafe on al-Mutanabbi Street in Baghdad, Iraq. He is a man of great compassion and knowledge, a man who has used his own personal grief to nurture the ideas of truth and reconciliation, of forgiving but never forgetting. It is a great honor to have one of our readings for al-Mutanabbi Street at his cafe this year. And a great honor to work with our good friend, the Iraqi poet/activist, Amal Al-Jubouri, the Director of the Soutuna Project, who has brought the ideas of this project back to the country and people that inspired it; Iraq and its cultural communities. No one can ever deny that we are sisters and brothers in this effort. 3. In Steamboat Springs, Colorado, (USA) – The Artist/Activist Janet Bradley Will Coordinate an evening of poetry and film on Monday March 5th at the Bud Werner Memorial Library at 6.30pm. 4. A Reading for Al-Mutanabbi Street, Sunday, March 5th 2018 at 7pm at Best Video Film and Cultural Center 1842 Whitney Ave. Hamden, Connecticut, 06517. On the anniversary of the 2007 bombing of the booksellers’ market in Baghdad, and in defiance of the ongoing attacks throughout the world against reading and readers, excerpts from the anthology Al-Mutanabbi Street Starts Here will be read by Daisy Abreu and Stephen Vincent Kobasa. 5. In San Francisco, California (USA)- Two readings on March 5th: one at Bird & Beckett Bookstore, 7-9pm, coordinated by Eric Whittington, bookstore owner and activist. The other will be from 6-8pm at the Fort Mason Chapel in conjunction with the Sanctuary exhibit there. Thanks go to Jackie Von Traskow, director of the For-Site Foundation, for making this possible. The poets Tamsim Smith and Gary Gach will also be part of this reading. 6. In Bristol, UK – At UWE, Bristol artist/educator/activist Sarah Bodman and artist/activist Catherine Cartwright will coordinate a reading event, 12.30 on 8th March at Portakabin 1, Bower Ashton campus. See poster below. 9. In Dearborn, Michigan (USA), a reading on March 18 at the Arab American National Museum presented by The Mesopotamian Forum for Art and Culture. This reading will be in Arabic and English and is co-ordinated by Dunya Mikhail and Alise Alousi. 11. In Dublin, Ireland – At Books Upstairs, the famous independent literary bookshop. Sunday March 4th at 3pm. Co-ordinated by writers Evelyn Conlon and Sean O’Reilly. 12. In St-Jerome, Quebec (Canada) on March 21st 12=2pm. Coordinated by the Educator/Activist Elyse Dupras. See poster below. 13. In San Francisco, California (USA) – A reading at the Sanctuary Exhibit in the Fort Mason Chapel, coordinated by the FOR-SITE Foundation, a non-profit public art organization dedicated to the creation, understanding, and presentation of art about place. 14. In Venice, Italy, a reading at Scuola Internazionale di Grafica Venezia, coordinated by Roberta Feoli Artist/Activist and Printshop and studio manager at Scuola. 15. A reading at the University of Gloucestershire (U.K.). 4.15pm. Tuesday 6 March at The Drawing Studio, FCH Campus, HC302, Cheltenham GL50 4AZ. Coordinated by the printer/educator/activist Andrew Morrison. See poster below. 16. In Cairo, Egypt – Monday March 5th at 1pm. A reading at The American University in Cairo (AUC) coordinated by the educator, Philip Croom and Heba Sheta. See poster below. 17. A reading in New York City, on April 4th, with Arab American writers at the Asian American Writers’ Workshop. 22. In Paris, France, Tuesday 6th March at 7pm – A reading organized by the writer/activist Adina Rulu. See poster below. 23. In Palo Alto, California – A reading organized by the poet/activist, Esther Kamkar. 24. In Northampton, Massachusetts – A reading at Broadside Bookshop, Inc. 247 Main Street, on Tuesday March 6, – Organized by the writer/activist, Claudia Lefko. See poster below. 25. At Ashoka University, just outside New Delhi, India. Organized by the writer/educator/activist, Aditi Sriram. In Al-Najaaf, Iraq – A reading organized by the Moja Youth team. In Kirkuk, Iraq – A reading is being organized by the National Foundation for Diversity, through the efforts of Dr. Ahmed Hussien Ali Kataw, the chairperson of this NGO. The poet/activist, Amal Al-Jubouri has written me that four more cities in Iraq have joined us with readings: Babel (near the archeological site), in Falluja, in Al-Ramadi, and in Heat (Anbar) coordinated by the youth group Shaqoufyan. You can read about Mary’s bookmarks here.